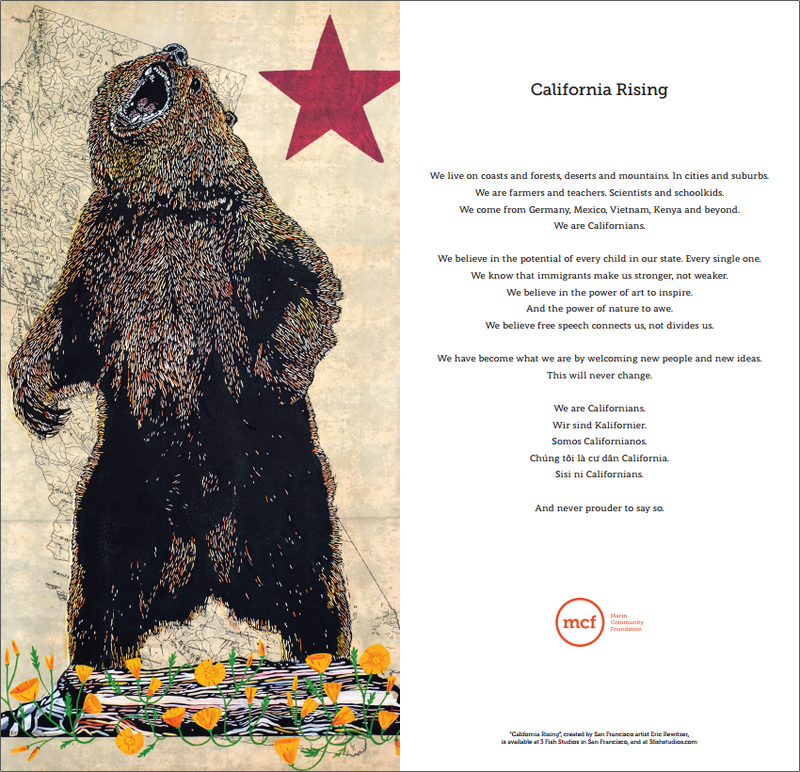 Link to the printable pdf copy of that art work and poster: California Rising, Marin Community Foundation. taped up onto our kitchen wall. 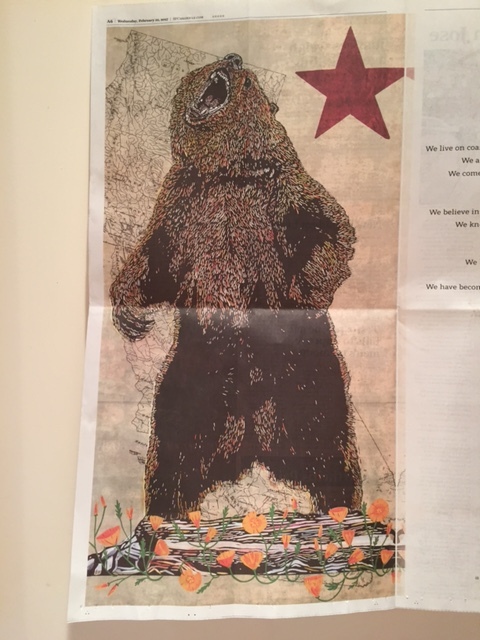 That newspaper art and poster, hanging on our wall! “We have become who we are by welcoming people and new ideas. 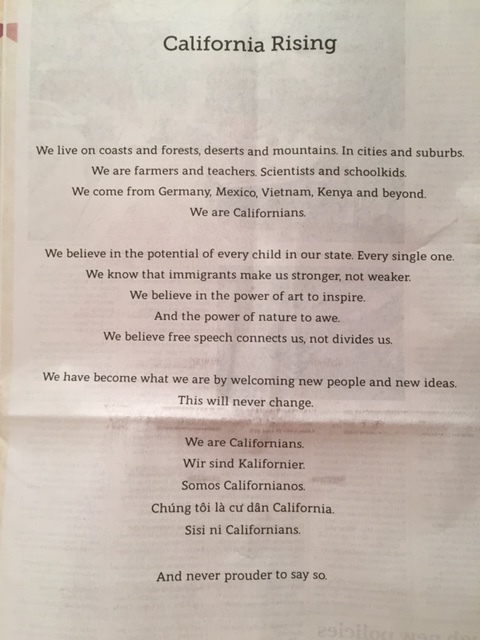 “As a life-long resident, I’ve never been more proud than now to be a Californian. Amid the loud rhetoric and heated debate of the day, one can literally feel the upwelling of support for the human values and welcoming traditions that are the virtual watermark of our state. Anyone who knows the history of California knows that it has been the great flow of immigration that continually refreshes and revitalizes our culture, creativity and productivity. There is no better time than the present to celebrate and defend California’s dynamic force. 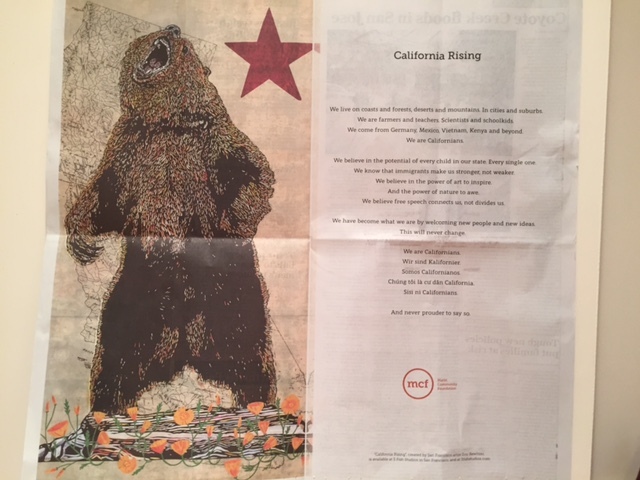 That’s why we created a statement from MCF, California Rising, which you’ll see below. This entry was posted in Life and tagged Appreciation, Compassion, Courage, Encouragement, Inspiration, Intention, Life, Loving kindness, Motivation, Persistence, Spirituality, Strength, Wisdom. Bookmark the permalink. I’d like to see the entire U.S. rising in compassion, love, and wisdom. Me, too! There seem to be some strengthening affirmations of positive qualities and actions starting to align and be expressed… I hope it continues!